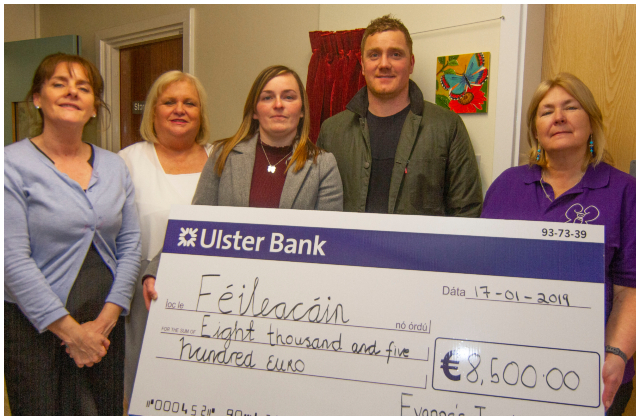 Claire and Jamsie Donnelly, from Killygordon, presenting a cheque for €8,500 at Letterkenny University Hospital to Mairie Cregan, Chairperson and founding member of Féileacáin. The money was the proceeds of a charity tractor run in memory of their baby Evanne. Also in photo are Marian Doogan, Assistant Director of Midwifery and Evelyn Smith, Director of Midwifery at Letterkenny University Hospital. The funds raised will be used in the local area.